How is a Basketball Court Constructed? 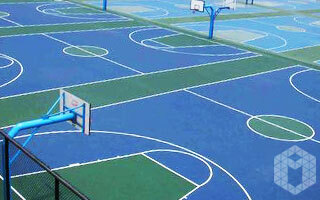 Basketball courts are sports facilities with artificial flooring which are enclosed by wire mesh. One of the most important issues on basketball court construction is certainly the ground of the basketball court. Mostly, tartan floor and acrylic floor paints are applied and used as basketball court floors, which are designed in high-quality standards. 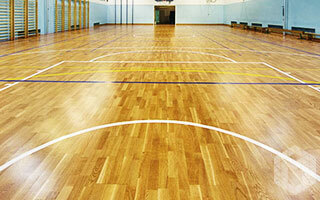 The polyurethane which is PVC sports flooring material are used quite efficiently especially at the indoor sports halls. The dimensions of the basketball court are determined to be 15m x 28m. Basketball Courts are constructed in 4 main stages. The works start with infrastructure works, then continue with lighting, iron and mesh works, and finally, it is completed with the installation of flooring. Stirrup concrete is prepared and the anchorages are placed at first at Infrastructure works. Subsequently, helicopter concrete or asphalt of 10 cm thickness is applied on the ground. Iron pipes with the height of 4 m or 6 m are welded to the anchorages. At least three layers of pipes are welded parallel to each other horizontally between these poles. PVC coated wire mesh with a mesh size of 5cm x 5cm is installed on the frame. Lighting is connected to the main poles in line with the customer’s request. One of the artificial basketball flooring types is applied at this stage of the basketball court construction. 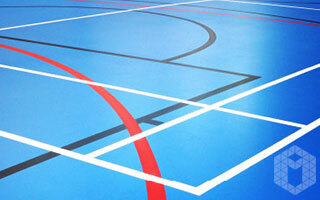 Acrylic floor paint and tartan floor are mostly preferred in outdoor courts. We can also apply rubber added cushion acrylic as an acrylic option. You can also request quotation for standard or NBA basketball hoops, tribune seats for indoor basketball courts, and score board applications. Different costs can arise based on the materials and the dimensions of the basketball court. Outdoor or indoor basketbal court cost vary depending on the rubber material and acrylic paint used for the floor. The prices vary depending on the tartan floors or polyurethane floors in the same way. You can learn all about the dimensions of the basketball court in detailed on this web site and you can get detailed information about the costs of a basketball court. You can fill out the form on our contact page to get a quotation. These floors designed to be used for many years are comfortably used without any problem. And also, the dimensions of the basketball court are prepared properly in accordance with FIBA rules. What are the Dimensions of the Basketball Court? The size of a professional or outdoor basketball court is generally designed to be 28 m by 15 m while the standard height of the basketball hoop is 3,05 m above the ground. Usually, acrylic flooring is mostly preferred and then the courts with rubber floors come to the forefront as a normal flooring for the basketball courts. Flooring with acrylic floor paint is the most preferred artificial floor type today especially because it is economical and facilitates playing basketball comfortably. Get the price of outdoor and indoor basketball court construction and installation of basketball flooring types.